“Music by Early Renaissance Composers Who Remain Anonymous” would probably present the widest scope for an early music program. Barring that, a likely candidate would a generic offering of music from the courts of the 16th-century Hapsburgs. They’d conquered and married, after all, into the largest, most populated, most unwieldy European empire of the time. And if you want, you can even claim that works written to celebrate peace treaties involving a Hapsburg ruler, such as the Jubliate Deo composed in 1538 by Cristóbal de Morales for his employer, Pope Paul III, fit the category. I’m dubious about Josquin, however. He was only considered for a post by Maximilian, but the offer was never made, given his independent temperament. This begs the question why, given the extraordinary breadth of performance material available to Stile Antico within the parameters they themselves set, they still found it necessary to step outside those boundaries for more music. That aside, the SATB ensemble of 16 vocalists continues a practice I noted in one of the other discs of theirs I’ve reviewed, mixing “greatest hits” material with relative rarities. So on the one hand we have Josquin’s Mille regretz, Lobo’s Versa est in luctum, and Tallis’s Loquebantur variis linguis; but on the other, Isaac’s Virgo prudentissima, and Crecquillon’s Andreas Christi famulus. 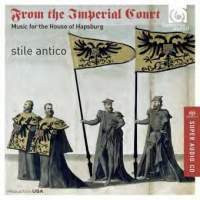 It is also one of two instances on this album where I could wish Stile Antico had slowed the smart pace they typically set themselves, to put greater emphasis on harmonic weight—either its sharp, wrenching movement, as in the circle of fifths in Absalon fili mi, or in the harmonically static sections of Andreas Christi famulus that layer imitative texture with great finesse. Otherwise, I’ve little but praise yet again for this ensemble’s concern for the niceties of dynamic shading, whether of the group as a whole or by emphasizing one or multiple voice parts in any given passage to make musical and textural points. Examples include the fading away on “douloureuse” in Josquin’s Mille regretz, or the subtle emphasis given to the basses at the conclusion of the first line extolling Emperor Charles V in the motet Carole magnus eras by Jacob Clemens, underscoring what appears to be a majestic cadence point only for the sopranos to use it directly upon arrival to delicately launch the next line. Enunciation is, as usual, excellent, and intonation dead-on in this often treacherously complex music. Stile Antico is a young SATB ensemble of 12 musicians who have produced six albums to date. I saw them two years ago at the Boston Early Music Festival, and was delighted with their range of colors that didn’t strive regularly for a uniform timbral blend, as much as for a subtle highlighting of parts when required. I’ve yet to hear an indifferent album by this group. The theme of From the Imperial Court may become tenuous at times, but the music-making is as rich as ever. Recommended.